This article describes how bipolar junction transistors work in terms of their semiconductor physics, with a simplified account of how the engineering of semiconductor materials with either excesses of electrons (N type) or deficiencies (P type) can lead to electronic devices that basically conduct in one direction only (the diode) or amplify signals (the BJT transistor). Bipolar junction devices, such as diodes (which conduct electricity in one direction, but not the other) and transistors (which allow a small current to control the magnitude of a larger current) are fundamentally based on the behaviour of semiconductors, and the effects produced by forming junctions between different kinds of semiconductors. To get a basic understanding of how these devices work, we will need to consider some of the physics and chemistry involved, since the workings of solid-state devices are very much dependent on the properties of atoms. The electrons in an atom are bound to the central nucleus by electromagnetic force. Classical physics considers them like planets orbiting a star, but this model does not give sufficient explanation of semiconductor properties, and therefore it is also necessary to include concepts obtained from quantum-mechanics, in that electron orbits are associated with discrete energy levels. The electrons are allowed to occupy only certain special orbits / energy levels, with the orbit closest to the nucleus having the lowest energy level. The allowed energy levels are actually spread over a limited range, called a band, and this fundamental concept is known as the "band theory". If an electron gains energy (for example, by absorbing an X-ray photon) it can move to a higher energy level. If it gains enough energy that it can escape the attraction of the nucleus, the atom has become ionised, that is, split into a separate positively charged atom and negatively charged electron. The energy level at which electrons start to be able to wander away from their atoms - and conduct electric current in the bulk material - is known as the conduction band. 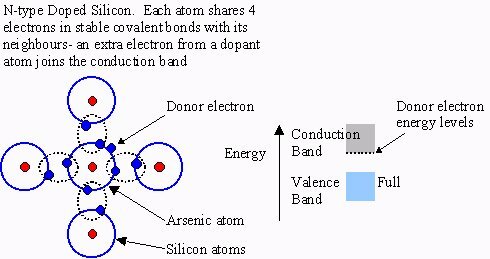 Just below the conduction band is the valence band, which is the energy level normally occupied by the outer electrons of an atom. Valence band electrons can not travel freely and can not conduct an electric current. Non-metallic elements usually have four, five, six, or seven electrons in their outer shell. When atoms bond to other atoms, the underlying mechanism is that each atom should have an ideal number of electrons in their outer electron shell (i.e. 8, the "Lewis octet"). Non-metals bond to other elements by sharing electrons (a covalent bond) to effectively increase their number of outer shell electrons to the ideal; or gain electrons from other atoms to become a negative ion (i.e. an atom that is electrically charged because it has more electrons than protons) and make an ionic bond to a counterpart atom with a net positive charge. The electrons in a non-metal are bound to the local group of atoms that form the covalent or ionic bond, and can not flow freely through the bulk material to conduct electric current. 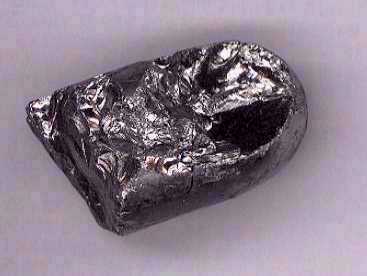 Metallic elements have one to three electrons in their outer shell. It is more likely that they will lose electrons to obtain a stable configuration. When this happens, the atom has a positive charge of one to three electron charges, and can form an ionic bond with a negatively charged atom. The outer shell electrons in metals can easily reach the energy levels required for conduction, which allows them to move freely throughout the metal and conduct electricity. Metal atoms are bonded together as positively charged ions surrounded by a "sea of electrons" that can move freely through the bulk material. Semi-metals, neither purely metallic or non-metallic, which are the basis for semiconductors, have an outer shell of electrons that have a distinct but small energy gap (1.1 electron-Volts for silicon) to cross to reach conduction levels. They have a mixture of properties between those of metals and non-metals. They are called semiconductors in electronics because their electrical conductivity lies between good conductors and insulators. Generally speaking, their electrical conductivity can be increased significantly by heating as the thermal energy is sufficient to raise the energy of some electrons to the conduction band (and naturally therefore, all semiconductor devices have properties that are sensitive to heat). Sulphur, one of the best insulating materials known (it was used by von Guericke in the first generator of static electricity in 1663, in the form of a friction pad rubbing against a large rotating sulphur ball, which, due to its low electrical conductivity, did not allow the electric charge to leak away). See "Materials Science for Engineering Students", by Traugott Fischer, Figure 11.2, for a chart showing possible ranges of resistivities for these and other materials (in Ω cm = 10-2 Ω m). A semiconductor with carefully controlled levels of other atoms (known as the dopant) can have its electrical properties greatly changed by even tiny proportions of dopant atoms. In the pure material (known as the intrinsic material), the electrons in the outer shell of the atoms are not free to travel through the material. A semiconductor useful for electronics needs to have a substantially non-conductive intrinsic state, so that current flow can be controlled. In a P-type semiconductor, the dopant atoms attract electrons from the intrinsic material's atoms to complete their outer electron shells. This leaves missing electrons, known as "holes", on the intrinsic atoms- and these holes are free to move (actually, the electrons in adjacent atoms move to fill the hole, leaving another hole, the combined effect being equivalent to a positively charged equivalent of an electron moving amongst the atoms). In N type semiconductor, a dopant is added that donates electrons to the material, which are free to move and conduct current. Both electrons and holes in a semiconductor can act to conduct an electric current across the semiconductor, and hence they are called carriers. The electrons in the N-Type, and the holes in the P-Type, are called the majority carriers, since they are the principal mechanism in each type for carrying current. However, it is also possible for the opposite type of carrier to be introduced into a semiconductor in which case these are called the minority carriers. So the P type semiconductor has a shortage of electrons, while the N type semiconductor has a surplus of electrons. The result when you create a junction between the two types of material, is that the electrons from the N type material are absorbed by the holes in the P type material, leaving a region at the junction where neither free electrons or holes are present- in effect, an insulating layer similar to the original pure intrinsic material. This is a semiconductor diode- but if it has this insulating layer, how can it conduct electricity? In fact, if you apply a very low voltage across a bipolar junction diode, it won't conduct (much) in either direction! This is where bias becomes important. If a voltage is applied in one direction, known as forward bias, an electric field is created across the insulating junction that (as it overcomes the built-in electric field of the PN junction) attracts electrons from the N side to the P side. The higher the voltage, the more electrons make it over to the P side. For a semiconductor such as silicon, normally about 0.8 V is sufficient to start a significant flow of current. The flow of electrons fills the holes on the P side and continues as a current flow in the external circuit (according to convention, current flow is into the P side, but electron flow is out of it to the external circuit). If a voltage is applied in the opposite direction, known as reverse bias, the electric field created across the insulating junction acts to repel the free electrons in the N side from the junction, and repel the holes in the P side from the junction, and tends to increase the width of the insulating layer, with very little current flow (what does flow is called leakage current). So, the most important characteristic of a P-N junction is that it conducts an electric current when the applied voltage is in the polarity of forward bias, but will not conduct when the applied voltage has the opposite polarity of reverse bias. Moving on to bipolar junction transistors, which provide the ability to amplify a current, their basic structure is a stack of three alternating types of semiconductor, which is equivalent to two P-N junctions. Now, if you simply stacked three thick layers of N, P and N type material, you would get two diodes back-to-back, and that would behave no differently to something like the BAV70, which is a double diode in a SOT23 package with common cathodes. The key to the transistor's amplifying properties is that the two junctions are very close together, so that the middle layer of semiconductor is a very thin layer. There are other subtleties such as the proportion of dopants used in various regions, which I will skip over here. The thin layer in the middle is called the base. In normal operation, the two ends of this sandwich, called the emitter and collector, have a bias voltage applied across them. 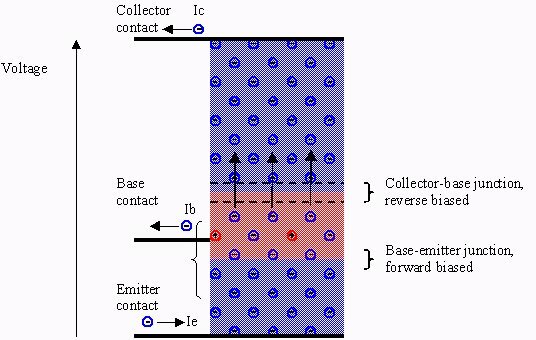 The collector is reverse biased with respect to the base, but the emitter is forward biased with respect to the base. The junction on the collector side is therefore insulating, at least we will assume so to begin with. As the base-emitter bias voltage is increased, the base-emitter junction begins to conduct and current carriers flow into the base. The first few carriers recombine with their counterparts in the base. But as they continue to arrive in the base layer, because of its close proximity to the collector, they arrive in an electric field set up between the collector semiconductor and the base, which causes the carriers to continue flowing into the collector before recombining with the remaining counterpart carriers in the base layer. As a result, more current flows from the emitter to the collector than from the emitter to the base. This current is controlled by the base-emitter current, providing amplification.